I'm gearing up for the upcoming summer campaign "Treachery and Greed" at Warhammer-Empire.com. So even though I've got ancients I need to finish, and a new army book for the Skaven, I'm also starting to look back at some of the Empire/Marienburg stuff, and by extension, my medeival & renaissance figures. First up is a small unit of Ogre mercenaries I apparently started over three years ago. They're old GW figures from Marauder Miniatures. I'm on the lookout for some of the others from the set... in case anyone can help me out. ;) Also looking for more of the tiny Marauder halflings, too. So expect some more Empire/Marienburg/DoW/Tilean/Renaissance stuff goodies like this coming up. I'm also keeping busy as part of the campaign staff, working on some more stuff. Mostly secret for now, though I'm excited to be doing another map. I really enjoyed painting/drawing the two campaign maps last year. Sadly I've been trying to get more of those ogres for years, without success. 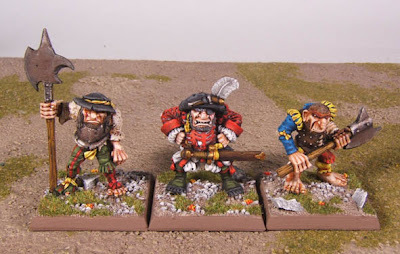 I do, however, have some of the Marauder dwarfs on my painting table. Very nice paint work on some classic mini's.Some of their old stuff is still the best.